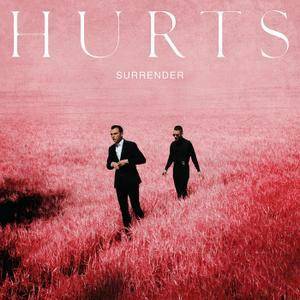 "Surrender" is the third studio album by English synth-pop duo Hurts. Debuting at #12 in the UK Albums Chart, the album features the singles 'Some Kind of Heaven', 'Rolling Stone', 'Lights', 'Slow' and 'Wish'. Though the duo sometimes return to the comparative safety of moping synthetic orchestras, and soul-reflecting mirrors lying conveniently on the Camberwell Road pavement, for the most part, there's a new sense of fun to Hurts. If Hurts' previous release, 2013's Exile, expanded on the grayscale minimalism of their 2010 debut with a symphonic grandiosity that imbued their sound with tasteful hints of color, then their 2015 release Surrender marks their entree into luminous, full-scale chromatism. Centered on the talents of vocalist Theo Hutchcraft and instrumentalist Adam Anderson, Hurts have built a rabidly loyal following with their distinctive, highly stylized sound. Joining Hurts here is Exile's Jonas Quant, along with Grammy-winning producers Stuart Price (Madonna, the Killers) and Ariel Rechtshaid (Haim, Vampire Weekend). Hutchcraft and Anderson remain in creative control, however, approaching their '80s-esque brand of pop/rock with as much deft precision as ever. The main difference here is the overall feeling of buoyancy, as Hutchcraft and Anderson apply their top-shelf pop songcraft to a decidedly more energized and euphoric collection of tunes than we’ve heard from them in the past, like the '70s disco-inspired "Lights," and "Kaleidoscope." Even when contemplating the dichotomous complexities of romantic love, as Hutchcraft does on "Why," singing, "If this is love, why does it hurt so bad?," his yearning ennui can't bring down the track's pulsating, flamenco-steeped house beat. And yet Surrender still manages to retain all the orchestral glory and synth-laden drama of Hurts' previous efforts, even as the tracks border on feeling downright uplifting. And as always, it's all brilliantly hooky and infectious, each cut stacked with inspired moments of production levity, as in the kinetic handclap breakdown in "Some Kind of Heaven," or the Daft Punk-style robot voices toward the end of "Why." From its gospel-steeped title track intro, to its tender piano ballad ending, Surrender plays as one giant, flamboyant arc; a backward swoon onto the bloody dancefloor. As Hutchcraft sings on "Some Kind of Heaven, "I am ready for the rapture/I am reaching for the light/But my heart screams hallelujah."